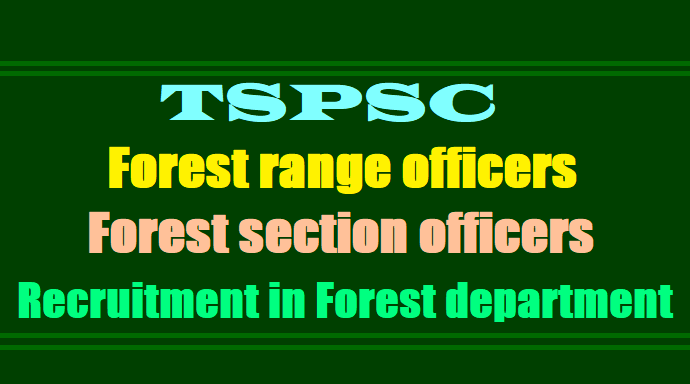 TSPSC Forest Range Officers, Forest Section Officers Results 2018: TSPSC Forest Range Officers, Forest Section Officers 2017 Recruitment Exam date, Hall tickets, Answer key: TSPS FRO, FSO posts: TSPSC Forest range officers, Forest section officers Recruitment 2017 in Telangana State/TSPSC Forest range officers, Forest section officers 2017 Recruitment in Forest department, TSPSC FRO Hall ticket, TSPSC Forest Range Officer Hall Ticket, Tspsc.gov.in, TSPSC hall ticket Download, TSPSC Forest Range Officer 2017, TSPSC Hall Ticket, TSPSC FRO officer syllabus, TSPSC Hall Ticket 2017, Forest Range Officer 2017, Forest Range Officer 2017 Hall ticket: Telangana State Public Service Commission(TSPSC) has published the Forest range officers, Forest section officers 2017 Recruitment notification on 15-08-2017(notification 46, 47/2017dt.15.08.2017) and Applications are invited Online from qualified candidates through the proforma Application to be made available on Commission’s WEBSITE (www.tspsc.gov.in) to the post of Forest Section Officer in Forest Department (EFS&T). ANDApplications are invited Online from qualified candidates through the proforma Application to be made available on Commission’s WEBSITE (www.tspsc.gov.in) to the post of Forest Range Officer in Forest Department (EFS&T) in the State of Telangana. తెలంగాణ రాష్ట్ర అటవీశాఖలోని FSO, FBO పోస్టులకు రెండో విడుత ఫిజికల్, వాకింగ్ టెస్టులు నిర్వహించనున్నట్టు టీఎస్‌పీఎస్సీ వెల్లడించింది. హైదరాబాద్‌లోని నెహ్రూ జూలాజికల్ పార్క్‌లో న వంబర్ 5, 6న ఉదయం 5.30 గంటల నుం చి నిర్వహించనున్న టెస్టులకు సంబంధించిన జాబితాను వెబ్‌సైట్లో పొందుపరిచామని తెలిపింది. టెస్ట్‌లు పూర్తిచేసుకున్న అభ్యర్థుల ధ్రువపత్రాలను పరిశీలిస్తామని చెప్పింది. It is informed that in continuation to the result Notification dt; 27/04/2018 on the basis of written examination held on 22/10/2017 FN & AN for the post of Forest Section Officer in Forest Department Notification No. 47/2017, the list of Hall ticket Numbers of the candidates in second spell who are provisionally admitted to Physical and walking test are hosted on the Commission’s website (www.tspsc.gov.in) and the said test will be scheduled on 05/11/2018 & 06/11/2018 from 5:30 AM onwards at Nehru Zoological park, Bahadurpura, Hyderabad. The candidates who successfully qualify in Physical and walking Test will be called for verification of Certificates. Note: It is here by informed to the candidates who completed their certificate verification on the condition of attending Physical and Walking test later on (to the post of Forest Beat Officer in Forest Department vide Notification No.48/2017 in obedience of Hon’ble High Court Orders in the W.P. No.21475, 22165, 22275) to attend Physical and walking test along with FSO second spell candidates on the same date and same venue i.e., on 06/11/2018 at Nehru Zoological park, Bahadurpura, Hyderabad. No person shall be eligible for appointment by direct recruitment posts in the service, unless he is not less than 163cms. in height, not less than 84cms. Round the chest on full inspiration and has a chest expansion of not less than 5cms. on full inspiration. a) In case of women candidates they must not be less than 150cms. In height not less than 79cms. Round the chest on full inspiration and has a chest expansion of not less than 5cms. On full inspiration. b) Provided the minimum height is relaxable by 5cms, in the case of the candidates belong to Gurkhas, Nepalese, Assamese, NAFA, Naga, Manipuri, Gauhati, Kummoni, Sikkimiese, Bhutanese and Scheduled Tribes. c) Provided further that in the case of candidates belonging to the Scheduled Tribes, where the reserved quota cannot be fully utilized for want of sufficient number of candidates possessing the requisite Physical qualifications, the Physical standards shall not be less than 158 cm. in height and not less than 78.8 cm. round the chest on full inspiration with a minimum expansion of 5 cms. It is hereby informed that on the basis of written examination held on 22/10/2017 FN & AN for the post of Forest Section Officer in Forest Department vide Notification No.47/2017, The provisionally admitted candidates who are qualified in Physical test and events are called for certificate verification with required certificates/documents which is to be held on 26-06-2018 & 27-06-2018 at Poti Sree Ramulu Telugu University, Near Public Gardens, Nampally, Hyderabad by 10:00 A.M. onwards. The candidates are hereby directed to exercise post preference/Web Options for post in Un-reserved, Local and Agency area (for Schedule Tribe candidates). The facility will be available from 22-06-2018 to 25-06- 2018. The candidates should avail this facility from 22-06-2018 onwards. Please visit the Commission’s website (www.tspsc.gov.in) for further details. TSPSC Forest Range Officers, Forest Section Officers Results 2018: TSPSC has conducted Written Examination for the above notification on 11/11/2017 & 12/11/2017. The Final Keys were released 15/02/2018. The results of FRO and FSO Exam Results are released on April 27. For further details please visit www.tspsc.gov.in. 1. It is hereby noticed that on the basis of written examination held on 11-11-2017 & 12-11-2017 to the post of F.R.O. in Forest Department, the candidates with the following Hall ticket numbers have been provisionally admitted to Medical. Physical Test and Events. The candidates who successfully qualify in Medical, Physical Test and events will be called for verification of certificates. posts in same Department (FRO,FSO) and will be held from 04-05-2018. 3. The candidates may note that they were provisionally admitted for written examination with condition that their candidature will be rejected at the time of verification, if qualification is not equivalent to the prescribed subjects as per notification. subsequent submission of any of the above certificates. In terms of the notification, the candidates should possess the requisite qualifications as on date of notification i.e. 15-08-2017.
requested to obtain and keep ready all the certificates as mentioned in the Notification. 6. If, on further Verification it is found that any candidate is not eligible with reference to the particulars furnished by him/her in the Application Form / Check List / Certificates, the results of such candidate / candidates shall be cancelled at any stage of selection process. in Medical, Physical Test and events will be called for verification of certificates. 4. The candidate who are admitted for the verification of Certificates are required to produce the Original Certificates along with one set of Photostat copies duly attested by Gazetted Officer, relating to Age, Qualifications Community (Integrated) , Latest Creamy Layer exemption certificate in case of B.Cs as per Memo No.3009/BCW/OP/2009, Government of Telangana, Backward Classes Welfare (OP) Department, Dt:18/12/2015 (prescribed format hosted on Commission’s website), Certificates relating to claim of age relaxation, Study (from 4th class to 10th class), Agency area certificates (For ST candidates only) basic information data (Check List(1set), attestation forms (2 sets) and if any, at the time of verification of documents, failing which, they will not be admitted in subsequent process of selection. No request will be entertained for subsequent submission of any of the above certificates. In terms of the notification, the candidates should possess the requisite qualifications as on date of notification i.e. 15-08-2017. 5. As per the Notification, “The post of F.S.O 100% reserved in Scheduled/Agency areas for local ST’s only”. In this regard the ST Candidates in Agency areas should produce local area certificate issued by the concerned Tahsildar/Mandal Revenue Officer is criteria for local candidature. 7. If, on further Verification it is found that any candidate is not eligible with reference to the particulars furnished by him/her in the Application Form / Check List / Certificates, the results of such candidate / candidates shall be cancelled at any stage of selection process. 8. The day wise schedule for Physical Test and Events will be hosted in the Commission’s website. Telangana State Public Service Commission (TSPSC), Hyderabad has released the hall ticket for Forest Range Officers (FRO) in Forest Department recruitment exam. The TSPSC FRO hall tickets are made available on the official website of the commission. Forest Range Officers in Forest Department recruitment exam will be held on November 11 and November 12 in OMR mode. To download the TSPSC FRO hall tickets, the aspirants may follow the steps given in this article. Paper-I General English will be (Qualifying Paper) 10.00 AM to 11.40 AM and Paper-II Mathematics (SSC standard - Qualifying Paper) (Bi-lingual) will be held from 2.30 PM to 4.10 PM on November 11. Paper-III General Studies (Bi-lingual) will be held from 10.00 AM to 12.30 PM and Paper-IV is Optional Paper which will be held 2.30 PM to 5.00 PM on Novemebr 12. Step Three: Enter TSPSC ID and Date of Birth in the next page, then download your hall ticket. TSPSC has recently conducted written examinations to the post of forest section officer and forest beat officer in Forest Department. N.B: Common for Men and Women Must undergo a medical Examination to be conducted by the Medical Board at Hyderabad and produce a health certificate signed by the Medical Board in the form prescribed by Article 49 of the Civil Service Regulations testifying to the candidates sound hearing and general physical fitness for out door work in the Forest Department and to the fact that he/she bears on his body marks of successful vaccination. Men : 152 Cms. Women: 145 Cms. Minimum 18 years & Maximum 31 years. The age is reckoned as on 01/07/2017 (Rule- 12(1)(a)(v) of State and Subordinate Service Rules). iii. Last date for submission of ONLINE applications is22/09/2017 for Forest Range Officer. 1. FRO: The Examination (Objective Type) is likely to be held on Dt.11/11/2017 F.N & A.N and 12/11/2017 F.N&A.N. 2. FSO: The Examination (Objective Type) is likely to be held on 22/10/2017 FN &AN. The Commission reserves the right to conduct the Examination either COMPUTER BASED RECRUITMENT TEST (CBRT) or OFFLINE OMR based Examination of objective type.